A wagering system provided by a betting organiser for one or more players to bet on an event. Each of the players provides the betting organiser with monetary value in order to be eligible to participate in the wagering system. The betting organiser accumulates the monetary value provided by each of the players into a centralised prize pool prior to the commencement of the event. The event comprises a plurality of integers having at least first and second possible outcomes, whereby, if the first outcome occurs, the players who wagered on the first outcome win and, if the second outcome occurs, the players who wagered on the first outcome lose. At the conclusion of each integer, a pay off dividend is credited to each winning player. At the conclusion of the event, the centralised prize pool is distributed to the players with the highest accumulated value of credited pay off dividends. The present invention relates to a method and system for making a bet or wager on an event. Particularly, the present invention relates to a wagering system for making a bet on a racing or other sporting event. Wagering systems, including pari-mutuel or totaliser systems are well known. In conventional pari-mutuel betting/wagering systems, all bets of a particular type are placed together in a pool, taxes and a house “take” or “vig” are removed and payoff odds are calculated by sharing the pool among all winning bets. The pari-mutuel system is commonly used for gambling or wagering on horse racing, greyhound racing and all sporting events of relatively short duration in which participants finish in a ranked order. In pari-mutuel betting, the gambler bets against other gamblers, rather than the house. Depending on the facility rules, which might vary from event to event, other bets may also be offered which allow the user to pick the finishing position of more than one participant, pick the finishing position in more than one event or some other such combination of multiple possibilities. These are called exotics, and due to the much larger number of possible outcomes, generally pay higher dividends to the gambler making the bet. Another type of bet that generally pays higher dividends is a parlay or accumulator bet. This type of bet is a single bet that links together two or more individual wagers and is dependent on all of those wagers winning together. The benefit of the parlay is that there are much higher payoffs than placing each individual bet separately since the probability of being successful in all of the bets is relatively low. However, the significant drawback of a parlay bet is that if any of the bets in the parlay loses, the entire parlay loses. In recent times some totaliser agencies have offered a single parlay system, where a wager is placed on each race on the ticket but the winnings of one race are not parlayed into subsequent wagers on the following races. In essence, this type of single parlay bet does no more than allow a player to make bets on a number of races using a single ticket. However, in a conventional parlay bet, a gambler can expand their options by parlaying their bets over two, three, four, five, six (or more) events, such as individual races, individual sporting matches etc. This is done by using a Formula Number, which means the gambler doesn't have to be successful in every leg to be a winner. 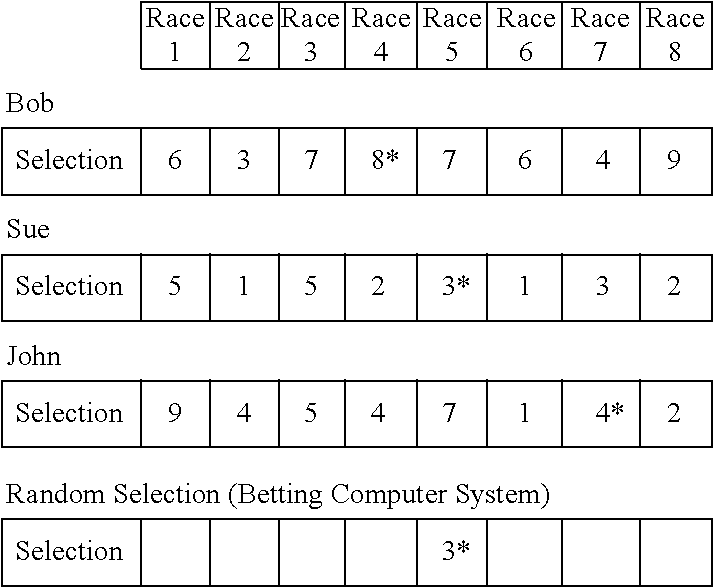 For example, if the gambler takes a Formula 3 bet over four races, the totaliser computer system will automatically generate all possible combinations of three races with this bet. To collect a dividend, the gambler must be successful in at least three of the four races that were selected. The Formula Numbers enhance the longevity of the parlay bet in so far as the entire parlay is not lost should a single bet in the parlay lose. However, to reduce the costs of placing a parlay bet, a gambler is likely to select a lower Formula Number, which results in the gambler losing the entire parlay should a minimal number of the bets in the parlay lose. For example, if the gambler selects a Formula 3 bet over four races, whilst a single bet on one of the four selected races can be lost, should any more than a single bet be unsuccessful, then the entire parlay will also lose. Of course, if the entire parlay bet is lost, then the gambler's interest in following the subsequent events may be significantly diminished. Events that are commonly bet on by gamblers generally consist of a number of individual stages that occur over an extended period of time. For example, on race day at a horseracing track there are generally six to ten (or more) races held throughout the course of the day. In another example, a single round of football or the like, generally consists of a number of matches or fixtures that are played between opposing teams of a competition or league, and are played over the course of a week or during a weekend. In these situations, it would be desirable for gamblers to be able to make a single bet, which would last for the entire duration of the event, such as the entire race day or the entire round of football, for example. In other words, a desirable wagering system is one such that the final outcome of the bet is not determined until at least a significant number of the individual integers of the event have been completed. For example, until such time as the final race of the day has been run and the order that the horses finish the race in has been determined, the outcome of the bet made by the gambler at the beginning of the day will not be known. Such a wagering system would be particularly desirable where individual gamblers “compete” against one another to win or share in a prize that is awarded to the most successful gambler or gamblers over the course of the entire event or at least a substantial portion of an event. Similarly, a prize could also be awarded to the most successful gamblers over a combination of multiple events, such as an entire football season consisting of a number of rounds, for example. Therefore, it would be advantageous to provide a wagering system having at least some of these desirable features. This would overcome at least some of the disadvantages of previously known approaches in this field, or would provide a useful alternative. According to a first aspect of the present invention there is provided a wagering system for one or more players to bet on an event. The event comprises a plurality of integers having at least first and second possible outcomes, whereby, if the first outcome occurs, the players who wagered on the first outcome win and, if the second outcome occurs, the players who wagered on the first outcome lose. At the conclusion of each integer, a pay off dividend is credited to each winning player and at least a portion of the pay off dividend is payed into an accumulative prize pool. At the conclusion of the event, the accumulative prize pool is distributed to the players with the highest accumulated value of credited pay off dividends. According to a second aspect of the present invention there is provided a wagering system for one or more players to bet on an event. The event comprises a plurality of integers having at least first and second possible outcomes whereby, if the first outcome occurs, the players who wagered on the first outcome win and, if the second outcome occurs, the players who wagered on the first outcome lose. 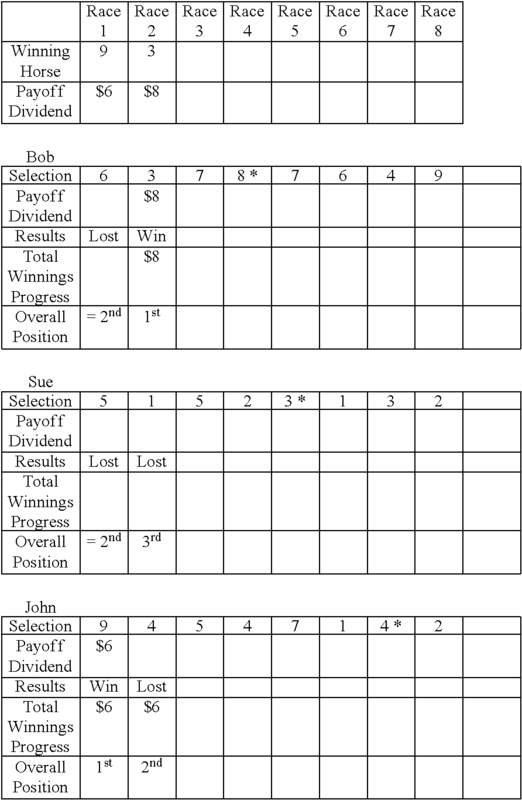 At the conclusion of each integer, a pay off dividend is credited to each winning player. At the conclusion of the event, the centralised prize pool is distributed to the players with the highest accumulated value of credited pay off dividends. According to a third aspect of the present invention there is provided a wagering system provided by a betting organiser for one or more players to bet on an event. Each of the players provide the betting organiser with monetary value in order to be eligible to participate in the wagering system. The betting organiser accumulates the monetary value provided by each of the players into a centralised prize pool prior to the commencement of the event. The event comprises a plurality of integers having at least first and second possible outcomes whereby, if the first outcome occurs, the players who wagered on the first outcome win and, if the second outcome occurs, the players who wagered on the first outcome lose. 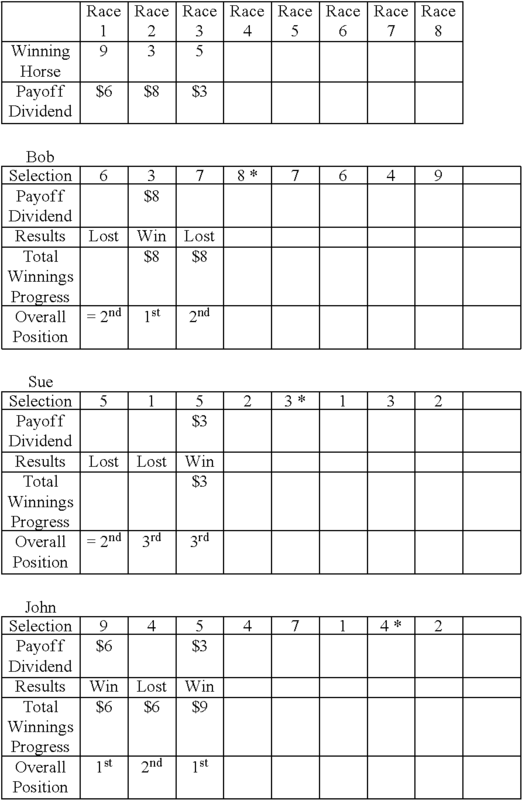 At the conclusion of each integer, a pay off dividend is credited to each winning player. At the conclusion of the event, a plurality of prizes are apportioned from the centralised prize pool, whereby each one of the plurality of prizes is a pre-determined percentage of the monetary value which is accumulated in the centralised prize pool. in the event that no player successfully selects all of the winning outcomes during the event, the monetary value of the third prize is accumulated into a jackpot prize pool. According to a fourth aspect of the present invention there is provided a wagering system provided by a betting organiser for one or more players to bet on an event. Each of the players provide the betting organiser with monetary value in order to be eligible to participate in the wagering system. The betting organiser accumulates the monetary value provided by each of the players into a centralised prize pool prior to the commencement of the event. The event comprises a plurality of integers having at least first and second possible outcomes whereby, if the first outcome occurs, the players who wagered on the first outcome win and, if the second outcome occurs, the players who wagered on the first outcome lose. At the conclusion of each integer, a pay off dividend is credited to each winning player. At the conclusion of the event, a first prize is paid to the player with the highest accumulated value of credited pay off dividends during the event. A further prize is paid to a player in the event that the player successfully selects all of the winning outcomes during the event. In the event that no player successfully selects all of the winning outcomes during the event, the monetary value of the further prize is accumulated into a jackpot prize pool. The first and further prizes are apportioned from the centralised prize pool, whereby each one of the plurality of prizes is a pre-determined percentage of the monetary value which is accumulated in the centralised prize pool. According to a fifth aspect of the present invention there is provided a wagering system provided by a betting organiser for one or more players to bet on an event. Each of the players provide the betting organiser with monetary value in order to be eligible to participate in the wagering system. The betting organiser accumulates the monetary value provided by each of the players into a centralised prize pool prior to the commencement of the event. The event comprises a plurality of integers having at least first and second possible outcomes whereby, if the first outcome occurs; the players who wagered on the first outcome win and, if the second outcome occurs, the players who wagered on the first outcome lose. At the conclusion of each integer, a pay off dividend, which is paid in accordance with variable odds calculated by the betting organiser, is credited to each winning player. At the conclusion of the event, a first prize, being a pre-determined percentage of the monetary value which is accumulated in the centralised prize pool, is paid to the player with the highest accumulated value of credited pay off dividends during the event. Preferably, the wagering system includes an input device connected to a betting agency's computer system, the input device being adapted for each of the players to enter one or more bets to the computer system via the input device, wherein each one of the bets entered by the players includes the player's wager for each of the integers of the event. Preferably, the players' bets must be entered into the computer system via the input device during a predetermined period of time, which expires prior to the commencement of the first integer of the event. Preferably, each integer of the event is contested by two or more participants, whereby the outcome of the integer is determined by the final ranked order of the participants at the conclusion of the integer. Preferably, each player selects at least one participant in at least one of the integers of the event and inputs this selection to the betting agency's computer system via the input device at the time of placing their bet. Preferably, the pay off dividends that are credited to each winning player are variable odds that are calculated by the betting organiser. Preferably, the jackpot prize pool is paid to a player at the conclusion of a subsequent event if the player successfully selects all of the winning outcomes during the subsequent event. Preferably, at the conclusion of the predetermined period of time, at least one participant in at least one of the integers of the event is randomly selected by the betting agency. The random at least one participant in at least one integer is preferably selected by one or more of a computer system or lottery. Preferably, an additional fourth prize is paid to any one or more of the players who select the same participant and integer of the event as randomly selected by the betting agency. Even more preferably, the fourth prize will be paid to those players that are otherwise eligible to be paid the fourth prize only if the selected participant is successful in the selected integer of the event. The event is preferably a race meeting or sporting competition. The race meeting is one or more of “horse racing, greyhound racing, harness racing, athletics, swimming racing, triathlon or motor racing” and the sporting competition is one or more of “a football competition, a cricket competition, a hockey competition, a basketball competition or a baseball competition”. The integer is preferably an individual race or sporting match. Preferably, the participant is successful in the integer by winning the individual race or sporting match. The individual race is any one or more of “a horse race, a greyhound race, a harness race, an athletic race, a swimming race, a triathlon or a motorsport race” and the sporting match is any one or more of “a football match, a cricket match, a hockey game, a basketball game or a baseball game”. Preferably, a further percentage of the wagers of each of the players' bets entered into the computer system via the input device is accrued, forming a further additional prize, which is distributed to the players after a predetermined number of events. A preferred embodiment of the invention will now be described, by way of example only, which relates to a method and system for a player or gambler to make a bet or wager on an event. Suitable types of events include, but are not limited to, race meets, such as horse racing, greyhound racing, harness racing, motor racing, swimming, athletics, triathlon etc. and all other sporting events, such as football competitions, cricket matches, hockey games etc. Essentially, any event that comprises one or more integers having a variable outcome, with participants finishing in a ranked order can be utilised by the wagering system of the present invention. Throughout the specification, the wagering system of the present invention will be described with reference to events, integers and participants. An event consists of a plurality of separate integers, which are contested by a number of participants. For example, an event may be a race day, consisting of a number of individual races (the integers) that are contested by a plurality of horses (the participants). Pari-mutuel or totalisator wagering systems have been developed and implemented by betting organisers, such as totalising agencies, licensed bookmakers, online wagering companies and the like, and include various proprietary hardware devices and software. In this way, a player or gambler can utilise a variety of methods to place a bet via an input device. For example, bets can be placed via an input device at off-course outlets, such as branch offices of totalising agencies, or can be made via other forms of input devices such as over the telephone, over the Internet, conventional trackside on-course betting outlets and the like. The present invention preferably utilises existing proprietary hardware devices and software and provides a new wagering system for players or gamblers to place bets on events of relatively short duration in which participants finish in a ranked order. However, it should also be understood that the present invention may also incorporate software and hardware systems specifically designed for the wagering system of this invention. For any given event, the players or gamblers must place their respective bets or wagers via an input device located at one or more of the available media, as outlined above. The input device is connected with the computer system of the betting organiser, such as TAB Limited. The players' bets or wagers must be submitted via the input device prior to the commencement of the event. This is because the bets or wagers made by each of the players include wagers for all of the integers of the event. Whilst it is preferred that the players' bets are input into a computer system, in other embodiments, the betting organiser may utilise a different system to organise the bets, dividends and calculation of odds. Taxes and a house “take” or “vig” are removed by the betting organiser from all of the wagers collected to create an initial money pool. Optionally, an operating fee may also be removed from this pool by the betting organiser. The operating fee and/or the take or vig is usually a fixed amount. However, these amounts may also be calculated as a fixed percentage of the amount wagered. After the necessary amounts have been removed from the initial money pool, the funds remaining in the pool are available for distribution back to the players or gamblers. There are four different prizes that are available to the players of the wagering system of the present invention. Each of these prizes are sourced from this initial money pool. The prize for selecting all the winning participants in each of the integers of the event constitutes approximately 10% of this initial pool (all winners prize pool), the mystery selection prize constitutes approximately a further 10% of this initial pool (mystery prize pool), the prize for selecting the most winning participants in each of the integers of the event constitutes approximately 10% and the accumulative prize pool is funded by the remaining approximately 70% of this initial pool if the first embodiment is used. The centralised prize pool is funded by the remaining approximately 70% of this initial pool if the second embodiment is used. These percentages are approximate only and additional prizes may be funded out of this initial pool of funds. The payoff odds for each participant being successful in the event are calculated. For example, the payoff odds are calculated for each horse either winning or placing in a horserace. The payoff odds can either be fixed or calculated by sharing the pool among all winning bets. In this preferred case, the final payout for a winning bet is not determined until the pool is closed, whereas with fixed odds betting, the payout is agreed at the time the bet is sold. 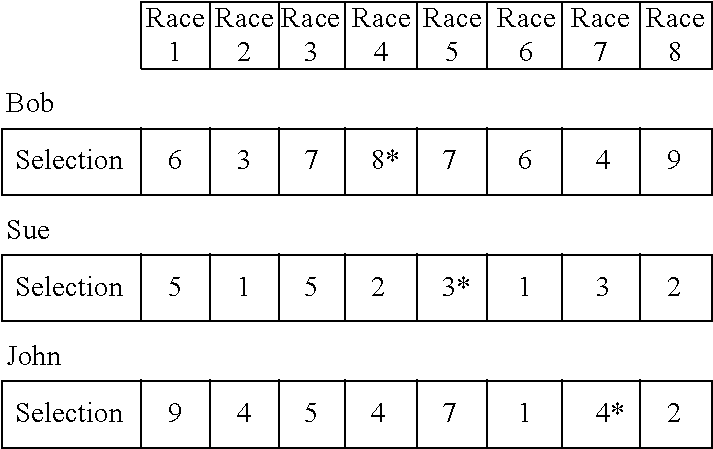 An example showing how the payoff odds are calculated in a parimutuel system for an event, which in this case is a horse race having eight running horses. All figures shown below are Australian dollars. Thus the total pool of money on the race is $514.00. First the commission or take for the wagering company is deducted from the pool, for example with a commission rate of 14.25% the calculation is: $514×(1−0.1425)=$440.76. Following the start of the race, no more wagers are accepted. The race is won by horse number 4, which had a total amount $55.00 wagered on it to win the race. The payout is now calculated. 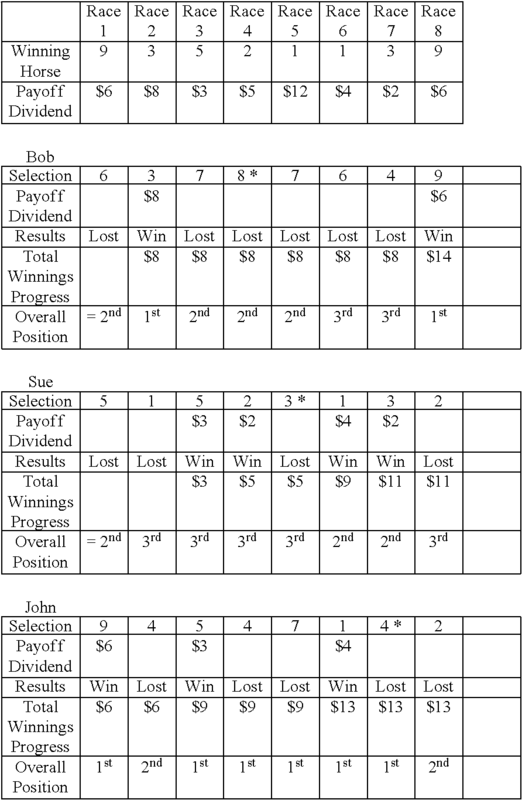 The remaining amount in the pool is now distributed to those who correctly wagered on horse number 4 winning the race: $440.76/$55=$8.00 per $1.00 wagered. This payout includes the $1.00 wagered plus an additional $7.00 profit. Thus, the payoff odds on horse number 4 are 7-to-1 (or, expressed as decimal payoff odds, 8-to-1). W T = ∑ i = 1 n  W i . After the betting organiser deducts a commission rate r from the pool, the amount remaining to be distributed between the successful gamblers is WR=WT(1−r). The winning gamblers who place a bet on the successful outcome of the event m, such as placing a bet on the winning horse, will receive a payout of WR/Wm for every dollar they bet on it. There are two embodiments of the present invention, which differ in how the winnings are accumulated according to the wagering system. However, the underlying wagering system is identical in both embodiments of the invention. In the first embodiment, each of the players or gamblers provides the betting organiser with monetary value in order to be eligible to participate in the wagering system of the present invention. The monetary value can be one or more of money, cash, credit card payments or the like. However, at least a portion of the monetary value is used to place bets or wagers on the integers of an event. After the conclusion of each integer, the winning prize value is then payed into an accumulative prize pool, which will be used to pay out prizes to one or more of the successful players. In the second embodiment, each of the players or gamblers provides the betting organiser with monetary value in order to be eligible to participate in the wagering system of the present invention. The monetary value can be one or more of money, cash, credit card payments or the like. The monetary value provided by each of the players is then payed into a centralised prize pool, which will be used to pay out prizes to one or more of the successful players. According to either embodiment of the present invention, prior to the event commencing, the player or gambler makes their selections and places their bets for their desired participants in each of the integers of the event. The bet placed by the player or gambler includes the player's wagers for each of the integers of the event. For example, the player will select which horses (participants) they believe will win each race (the integers) to be held on race day (the event). In another example, the player will select which football teams (participants) will win, lose or draw each football match (the integers) of the football round (the event). It is also preferred that the player or gambler selects one participant in one of the integers of the event as a “mystery selection”. Prior to the event commencing, the betting organiser's computer or other suitable system, such as a lottery or the like, will randomly pick one participant in one of the integers of the event as a “mystery selection winner”. If the participant that is selected by the betting organiser's system wins the integer of the event, all players or gamblers that selected that particular participant to win the chosen integer of the event will win/share in a “mystery selection” prize. The “mystery selection” prize can be decided by any number of suitable occurrences. For example, the mystery selection prize can be awarded to the players who select the winning participant in a race, such as the winning horse, greyhound, motor car, athlete or the like. Alternatively, the mystery selection prize can be awarded to the players who select the first try scoring or goal scorer in a sporting match, the first participant to score a home run in a baseball game, score the first points in a basketball game, get the highest amount of runs or take the most wickets in a cricket match or any other suitable occurrence during the course of one of the integers of an event. For example, a first player or gambler selects horse number three in race five as their mystery selection, whilst a second player or gambler selects horse number eight in race seven as their mystery selection. The betting organiser's computer system randomly selects horse number three in race five as the mystery selection. Fortuitously, horse number three is indeed the winner of race five. Therefore, as the first player or gambler picked the same mystery selection that was randomly selected by the computer system and horse number three did in fact win race five, then the first player is awarded the mystery selection prize. In another example, a first player or gambler selects that John Smith from Sydney FC will score the first goal in the match between Sydney FC and Adelaide United during round 3 of the A-League football competition. A second player or gambler selects that Frank Lowry from Melbourne Victory will score the first goal in the match between Melbourne Victory and Perth Glory during round 3 of the A-League football competition. The betting organiser's computer system randomly selects that John Smith from Sydney FC will score the first goal in the match between Sydney FC and Adelaide United during round 3 of the A-League football competition. Unfortunately, Anthony Poppovich of Adelaide United scores the first goal in this match. As a result, even though the first player or gambler selected the same mystery selection as randomly picked by the betting organiser's computer system, because John Smith did not score the first goal in this match, the first player or gambler does not win/share in the mystery selection prize. Three players Bob, Sue and John have visited a horse track on race day and want to utilise the wagering system of the present invention. The race day consists of eight races. The selections for each of the eight races of the day must be made before the start of the first race. Bob, Sue and John also select one horse in one of the races that is to be run that day as their “mystery selection”. As can be seen above, Bob selected race 4, horse number 8, Sue selected race 5, horse number 3 and John selected race 7, horse number 4 as their mystery selections. The only player that is now potentially eligible to win or share in the mystery selection prize is Sue, who selected the same horse number in the same race as was randomly selected by the computer system. However, in order for Sue to win or share in the mystery selection prize, horse number 3 must win race number 5. After each of the integers in completed, those players or gamblers who correctly wagered on the participant who was the winner of the integer will be paid a dividend, which is calculated in accordance with the payoff odds. In the first embodiment it is preferred that the full amount of the winning dividends are collected in an accumulative pool, which forms a major prize to be won/shared by the most successful players at the end of the event or combination of multiple events. In the second embodiment it is preferred that the full amount of the centralised pool, which forms a major prize to be won/shared by the most successful players at the end of the event or combination of multiple events. In order to determine which player or gambler is the most successful, a running tally of results is maintained and updated after the conclusion of each integer of the event. The player or gambler that has been paid the most dividends and thus has the most winnings at the end of the event is the most successful and wins the accumulative pool in its entirety or will share in the accumulative pool in the event where multiple players have won equal amounts of money at the end of the event if the first embodiment is used. The player or gambler that has been paid the most dividends and thus has the most winnings at the end of the event is the most successful and wins the centralised pool in its entirety or will share in the centralised pool in the event where multiple players have won equal amounts of money at the end of the event if the second embodiment is used. The way that the dividend is paid to those players or gamblers who correctly wager on the participant who is the winner of the integer differs in accordance with the two embodiments of the present invention. In accordance with the first embodiment of the present invention, where at least a portion of the monetary value is used to place bets or wagers on the integers of an event, the dividend that is paid to each of the successful players may either be simply a value that is credited to the player or can be an actual monetary award or prize. Where a monetary value is used to place bets or wagers on the integers of an event, it is preferred that the full amount of the winning dividends are placed into an accumulative prize pool. At the end of the event, only the most successful players win or share in this accumulative prize pool. Alternatively however, those successful players who correctly select the winning participant of each integer, may receive a portion of their monetary value winning dividends after each successful wager on an integer of the event. In this case, the remainder of the winnings are paid into the accumulative prize pool. According to the second embodiment, where the monetary value provided to the betting organiser by each of the players or gamblers is accumulated into a centralised prize pool, the dividend that is paid to each of the successful players is simply a value that is credited to the player. This is because there is no actual wager or bet that is placed on each integer of the event, because all of the monetary value is initially placed in the centralised prize pool. As such, the player or players with the highest accumulated credited value at the end of the event wins or shares in the monetary value in the centralised prize pool. In accordance with either embodiment it is preferred that a progressive listing showing the position of the leading gamblers (in terms of the cumulative total paid in dividends to the gamblers) is displayed after the conclusion of each integer of the event. This adds to the excitement for each player or gambler because they can track their progress as to how they are placed relative to the other players, and ultimately whether they may be in a position to win or share in the accumulative pool. In this way, the players can see whether they move up or down positions in the overall order of players (in terms of the cumulative total paid in dividends to the gamblers) after the dividends are paid at the conclusion of each integer of the event. Three players Bob, Sue and John visit a horse track on race day and utilise the wagering system of the present invention. The race day consists of eight races. The selections for each of the eight races of the day must be made before the start of the first race. Bob, Sue and John also select one horse in one of the races that is to be run that day as their “mystery selection”. The betting organiser's computer system also makes a random mystery selection. Once all the bets have been collected prior to the first race of the day being run, the betting organiser (such as TAB Limited) removes their commission and pays any necessary taxes from this initial pool of funds. The payoff odds are then calculated for each of the horses in all of the eight races that are scheduled to be run that day. If one or more of the horses are scratched from any of the races, the players that had selected that horse will either be given the race favourite as their selection (known as a sub) or will be awarded a scratched dividend for that race. Horse number 9 is the winner of race number 1 and is paying a winning dividend of $6.00. After Race 1 there was only one winner, adding $6.00 to the accumulative jackpot pool if the first embodiment is used. The (payoff dividend) $6 is used only as a value to be calculated together to find the winner of the centralised jackpot pool if the second embodiment is used. Horse number 3 is the winner of race number 2 and is paying a winning dividend of $8.00. After Race 2 there was only one winner, adding $8.00 to the accumulative jackpot pool if the first embodiment is used. The (payoff dividend) $8 is used only as a value to be calculated together to find the winner of the centralised jackpot pool if the second embodiment is used. Horse number 5 is the winner of race number 3 and is paying a winning dividend of $3.00. After Race 3 there were two winners, adding $6.00 to the accumulative jackpot pool if the first embodiment is used. The (payoff dividend) $3 is used only as a value to be calculated together to find the winner of the centralised jackpot pool if the second embodiment is used. Horse number 2 is the winner of race number 4 and is paying a winning dividend of $5.00. After Race 4 there was only one. winner, adding $2.00 to the accumulative jackpot pool if the first embodiment is used. The (payoff dividend) $2 is used only as a value to be calculated together to find the winner of the centralised jackpot pool if the second embodiment is used. Horse number 1 is the winner of race number 5 and is paying a winning dividend of $6.00. The mystery selection that was randomly selected by the betting organiser's computer system was horse number 3 in race 5. Therefore, because horse number 3 did not win race 5, Sue does not win the mystery selection prize. After Race 5 there were no winners and no money was added to the accumulative jackpot pool if the first embodiment is used. The (payoff dividend) $0 is used only as a value to be calculated together to find the winner of the centralised jackpot pool if the second embodiment is used. Horse number 1 is the winner of race number 6 and is paying a winning dividend of $4.00. After Race 6 there were two winners, adding $8.00 to the accumulative jackpot pool if the first embodiment is used. The (payoff dividend) $4 is used only as a value to be calculated together to find the winner of the centralised jackpot pool if the second embodiment is used. Horse number 3 is the winner of race number 7 and is paying a winning dividend of $2.00. After Race 7 there was only one winner, adding $2.00 to the accumulative jackpot pool if the first embodiment is used. The (payoff dividend) $2 is used only as a value to be calculated together to find the winner of the centralised jackpot pool if the second embodiment is used. Horse number 9 is the winner of race number 8 and is paying a winning dividend of $6.00. After Race 8 there was only one winner, adding $6.00 to the accumulative jackpot pool if the first embodiment is used. The (payoff dividend) $9 is used only as a value to be calculated together to find the winner of the centralised jackpot pool if the second embodiment is used. 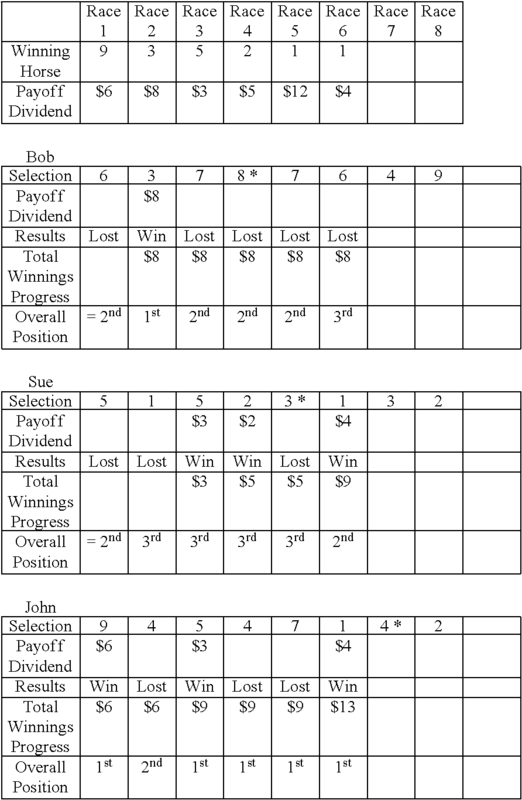 After the completion of all eight races, Bob was the most successful player having collected the most money in payoff dividends. Therefore Bob wins the accumulative jackpot pool of $38.00 if the first embodiment is used. Bob wins the centralised jackpot pool if the second embodiment is used. As none of the other players had won the same amount of money as Bob, the accumulative jackpot did not have to be shared amongst more than one player. None of the players selected all eight winning horses in each of the eight races, therefore the prize, (All Winners prize pool), for selecting all of the winning horses for the race day will jackpot to the next suitable race day event. In this example, a further jackpot prize is to be awarded to the player that correctly picked the most winners in each of the races held over the course of the race day event. In this case, whilst Bob was the most successful player having collected the most money in payoff dividends, Sue, who correctly picked four winners, would win this additional jackpot prize, (Most Winners prize pool). The mystery selection prize was also not won, so this prize will also jackpot to the next suitable race day event. (Mystery prize pool). The accumulated payoff dividends are used to find the winner in both the first and second embodiments of the present invention. They differ in how the winnings are accumulated according to the either wagering system. After the completion of all races. Players will preferably have a choice of competing against all other players making bets on a particular event or competing against a smaller group of players making bets on the event to win or share in the prizes offered for that event. If the player chooses to compete against all other players betting on the particular event, the player's initial wager and all winning dividends (or at least part thereof) will be entered into the combined pool along with all other players who are betting on that event. Where the player chooses to compete only against a small group of players for an event, such as a group of friends or work colleagues for example, the wagers made by the players in this small group will be entered into the combined pool along with all other players who are betting on that event. However, the winning dividends (or at least part thereof) of this small group will be entered into a prize pool that is solely contested by the players of this small group and do not contribute to the accumulative or centralised prize pool that is contested by all players making bets on the event who have not selected to be part of a small group. Thus, all players whether they are in a small group or not, will contest the mystery selection prize and the prize for the players who select all winning participants in each of the integers of the event. This is because these prizes are funded by the wagers of all players betting on the event, regardless of whether the players nominate to join a small group or not. In this way, the players in the small group can compete with each other for a “minor” accumulative prize but still have a chance of winning or sharing in the “major” mystery selection prize and/or the prize for the players who select all winning participants in each of the integers of the event. The wagering system of the present invention can also comprise one or more additional “super” jackpot prizes that extend over multiple events. Players or gamblers are entered into a “players club” or the like, which gives players, and particularly regular players, an opportunity to win or share in a major “super” jackpot prize, based on their overall accumulated winnings or credited dividends from a number of different events during a predetermined period of time. For example, a typical racing calendar will have many separate race day events held over a calendar year. Similarly, a racing carnival will have separate race day events held over a period of time, such as the Spring Carnival, for example. In addition to the prizes that are awarded during each race day event, an additional prize may be awarded to the player that has been most successful during all of the race days of the calendar year or the racing carnival. In other words, the player who has accumulated the most pay off dividend payments or who has accumulated the most credited dividends throughout the predetermined period of time will win a jackpot prize. In accordance with one embodiment of the present invention, a very small percentage the monetary value provided to the betting organiser by each of the players or gamblers throughout the course of the predetermined period of time is accumulated into an additional centralised prize pool. Whilst the amount of money that is placed into this additional centralised prize pool from the monetary value provided by each player will be small, over the duration of the multiple events throughout the year, this prize pool will nevertheless grow to become a significant amount of money. In accordance with a further embodiment of the present invention, to fund this additional jackpot prize, a very small percentage of all wagers placed by all players throughout the course of the predetermined period of time are accumulated into an additional prize pool. Whilst the amount of money that is placed into this pool from each individual wager that made will be small, over the duration of the multiple events throughout the year, this prize pool will grow to become a significant amount of money. This additional jackpot prize can be contested by all players that make bets in relation to one particular type of event over a period of time, such as all players who make bets at Sydney's Randwick racecourse over the duration of one calendar year or a racing carnival. Alternatively, this additional jackpot prize can be contested by players that make bets in relation to a multitude of different events, such as all players who make bets at all designated race tracks over a period of time, where the race tracks are not limited to a single city, state or country. It is also envisaged that the events may not be limited to a single type of racing or sport. For example, this additional jackpot may be contested by all players who make bets for a combination of horse racing, motorsport racing, football etc. Whilst there is only a single mystery selection prize per event in the preferred embodiment of the present invention, it should be understood that there may be more than one mystery selection prizes either per event or per integer. For example, there may be more than one horse per race that can be selected as the mystery selection or players may be able to select winning horses in more than one race during the course of the race day. The requirement that the mystery selection randomly picked by the betting organiser's computer system or other suitable method must also win the integer of the event, such as the horse race, in order for those players who had picked the same mystery selection to win or share in the mystery selection prize can also be removed. Both of these alterations to the present invention would result in the shortening of the odds of the mystery selection prize being won during an event. This may be useful where the mystery selection prize has not been won for a number of events and has jackpotted to a substantial amount of money. In order to increase the likelihood that the prize will be won, multiple mystery selections may be allowed at select events and/or the requirement that the mystery selection win the nominated integer at the event may be removed. In another embodiment of the present invention, the mystery selection prize may be removed altogether, whereby the only prizes available to be won by the players or gamblers would be the accumulated or centralised prize pool and the prize for correctly selecting all winners of each of the integers of the event. Whilst it is preferred that the full amount of the winning dividends are placed into the accumulative prize pool and only the most successful players will win or share in this prize pool at the end of the event, in other embodiments, the players may receive a portion of their winning dividends after each successful wager on an integer of the event. For example, all successful players may receive 20% of the pay off dividend at the completion of the integer of the event, with the remaining 80% of the winnings being placed into the accumulative prize pool, to be won/shared by the most successful players overall at the end of the event. Given the low odds of any of the players correctly picking the winning participants in each of the integers of the event, it is likely that the prize payable for this scenario occurring will not be won very often. Therefore, this prize will likely jackpot over a substantial number of events and will grow to become a substantial financial prize. It is preferred that this prize be limited or capped at a predetermined amount, $1,000,000 for example. Where the prize becomes too large, additional prizes can be created, using the funds allocated to the large prize. Suitable additional prizes may include, for example, a prize payable to the players that select the most winning participants in the integers contested over the course of one or more events. Other suitable prizes are also included within the scope of the present invention. In another embodiment, a percentage of the pay off dividend payed to each successful player after each integer of the event, is parlayed into one or more of the following integers of the event. For example, all successful players may receive 20% of the pay off dividend at the completion of the integer of the event, with the remaining 80% of the winnings being placed into the accumulative prize pool, to be won/shared by the most successful players overall at the end of the event. The 20% of the pay off dividend that is payed to each of the successful players is then parlayed into successive wagers placed on the following integers of the event. It is preferred that the player or gambler who is credited with pay off dividends with the highest accumulated financial value will win or share in the accumulative or centralised prize pool. However, in other embodiments, the players or gamblers who are credited with the highest number of pay off dividends, as a result of successfully selecting the winning participants in the most number of integers, will win or share in the accumulative or centralised prize pool. While the invention has been described with reference to preferred embodiments above, it will be appreciated by those skilled in the art that it is not limited to those embodiments, but may be embodied in many other forms. In this specification, unless the context clearly indicates otherwise, the word “comprising” is not intended to have the exclusive meaning of the word such as “consisting only of”, but rather has the non-exclusive meaning, in the sense of “including at least”. The same applies, with corresponding grammatical changes, to other forms of the word such as “comprise”, etc. The invention has been developed primarily for use with placing bets on events such as thoroughbred horseracing, greyhound racing, harness racing and for other sporting events, such as bets upon first to score etc. However, it should be appreciated that the present invention is also suitable for a wide range of other events. Accordingly, the embodiments of the invention described hereinbefore are not necessarily limiting on the invention. wherein, at the conclusion of the event, the centralised prize pool is distributed to the players with the highest accumulated value of credited pay off dividends. 22. A wagering system of claim 21 including an input device connected to a betting agency's computer system, the input device being adapted for each of the players to enter one or more bets to the computer system via the input device, wherein each one of the bets entered by the players includes the player's wager for each of the Integers of the event. 23. A wagering system of claim 22 wherein the players' bets must be entered into the computer system via the input device during a predetermined period of time, which expires prior to the commencement of the first integer of the event. 24. A wagering system of claim 23 wherein each Integer of the event is contested by two or more participants, whereby the outcome of the integer is determined by the final ranked order of the participants at the conclusion of the integer. 25. A wagering system of claim 24 wherein each player selects at least one participant in at least one of the integers of the event and inputs this selection to the betting agency's computer system via the input device at the time of placing their bet. 26. The wagering system of claim 25 wherein a percentage of the wagers of each of the player's bets entered into the computer system via the input device is accrued, forming one or more additional prizes. 27. A wagering system of claim 26 wherein the event is a race meeting or sporting competition. 28. A wagering system of claim 27 wherein the race meeting is one or more of “horse racing, greyhound racing, harness racing, athletics, swimming, racing, triathlon or motor racing” and the sporting competition is one or more of “a football competition, a cricket competition, a hockey competition, a basketball competition or a baseball competition”. 29. A wagering system of claim 28 wherein the integer is an individual race or sporting match. 30. A wagering system of claim 29 wherein the individual race is any one or more of “a horse race, a greyhound race, a harness race, an athletic race, a swimming race, a triathlon or a motorsport race” and the sporting match is any one or more of “a football match, a cricket match, a hockey game, a basketball game or a baseball game”. 31. The wagering system of claim 30 wherein the participant is successful in the integer by winning the individual race or sporting match. 32. The wagering system of claim 31 wherein at the conclusion of the predetermined period of time, at least one participant in at least one of the integers of the event is randomly selected by the betting agency. 33. The wagering system of claim 32 whereby only the players who select the same participant and integer of the event as randomly selected by the betting agency are eligible to win one of the additional prizes. 34. The wagering system of claim 33 wherein the additional prize will only be distributed to the eligible players if the selected participant is successful in the selected integer of the event. 35. A wagering system of claim 34 wherein the random at least one participant in at least one integer is selected by one or more of a computer system or lottery. wherein, at the conclusion of the event, the accumulative prize pool is distributed to the players with the highest accumulated value or credited pay off dividends.